John from The American Ostomy Club has just published a review about the StomaDome. "Hello Readers! Just started wearing a new product by StomalIte and I have to tell you I like it. I have seen a few ads on the internet from this company regarding the StomaDome and decided I would try it. Very happy I did. Very simple to use. t can be worn over your current bag so you don't need to order anything special from your medical supplier. Very simple product and very effective! The purpose of this device is to protect the very sensitive and delicate stoma. And the Dome does the job without preventing your stoma from functioning properly. The hard but nicely formed low profile plastic dome gave me a greater sense of protection as soon as I put it on. Over the past 15 years, I have been very cautious of my stoma area and go to great lengths to protect that area. Playing with the kids on the floor or in the yard was always a worry. I always seemed to get hit in THAT spot! A game of basketball was out of the question. Now you can do these activities with confidence that your stoma will be protected. I just wore it this past Christmas at our holiday party. While the Dome does protrude out slightly from my clothing it was not noticeable under a shirt and sweater. I was carrying things around the house and even bumped into a few things and the Dome protected my stoma very nicely. I did not panic as I would have. I have gone out walking a few times with the Dome under several layers of clothes. The Dome did a nice job of allowing some room for my stoma to drain properly. No pancaking around the stoma with several layers of clothes on. I worked in the garage on the car and did not worry about smashing or rubbing my stoma on a hard surface. I am not one to wear my seatbelt in the car. It always rubs right on my stoma causing minor bleeding. I tried it in the car and worked great. No rubbing. No irritation! I will start wearing my seat belt again. First time in 15 years! When it is time to change bag, peel off the Dome from the Velcro and replace the Velcro adhesive crescent with a new one on the new bag. Press the Dome back on to the new Velcro - you are done! Great product! Good for active people who are concerned about injury. Give it a try. The package comes with a Dome and 52 replacement crescents so you are set for a while! Larger quantities are available"
Over the past year I've learned there are many ostomy products and not many people or places that tell you what's best. I don't have the answers either, but I just wanted to let people know I understand there's a large undertaking to find the products that work for you. Ostomates are in a situation where things change over night. It's not like growing up and finding out what you like and don't like over the course of many years. It's not like switching from a PC to MAC and then deciding you don't even want a computer. Ostomates need to adapt and find what's best for them, because everyone is different. The adapting and trial and error process can be expensive, time consuming and a big learning process. With all the appliances, garments, accessories, skin solutions, belts and guards like StomaDome the task is daunting. I'm writing this to let you know we understand the task and really want to work with you to find the right guard for your ostomy. That is why we reiterate and honor our 100% money back guaranty. If you buy a StomaDome you can return it and get a full refund. All you have to do is send it back. It's been great to hear from our customers over the last year and find out that the StomaDome is working for them. I've been lucky enough to talk to many of our customers that are out doing the things they love. I've spoken to people that are doing yoga, fly fishing, hunting, working out or just driving long distances in comfort. I'll be featuring the fly fisherman (Jon Hall) in a later blog entry, I'm just waiting for the photos in the mail. Thanks for trying StomaDome we understand the process. 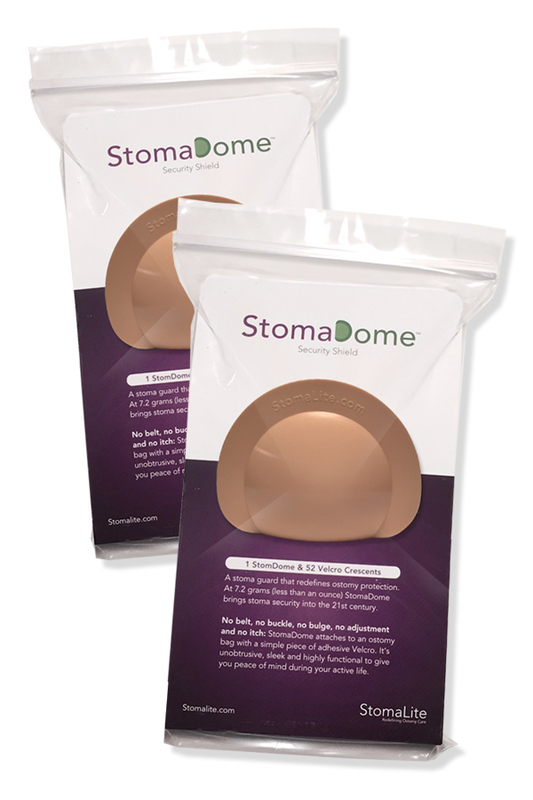 You can now purchase StomaDome Stoma Guard using our website interface, your PayPal account or Amazon.com. All three options are secure and easy to use. We've done this so people have the choice to use the payment method they prefer. Have a great week at WOW Joy! Thank you for your interest in StomaDome. Mike from StomaLite will be attending the UOAA National Conference this week. We hope to meet new people and learn more about UOAA and the ostomy community! !